BOSTON – In a rekindling of one of college hockey’s oldest rivalries in one of the most iconic venues in the world, Boston University will face Cornell University in a non-conference NCAA Division I men’s ice hockey match-up at Madison Square Garden in New York City on Nov. 24, 2007, BU Director of Athletics Mike Lynch and Cornell University Director of Athletics and Physical Education Andy Noel announced today. It marks the first time either school has played in the current incarnation of the “World’s Most Famous Arena” and the first college hockey game hosted by Madison Square Garden since 2003. Tickets for this historic event are already on sale directly through Ticketmaster.com and through the respective Boston University and Cornell University Athletic Ticket Offices. "Cornell Athletics and the Big Red hockey program are excited to renew our fierce rivalry with Boston University in one of the grandest venues in America," said Noel. "This will provide our hockey fans and New York City alumni an opportunity to support our team in what I expect will be one of the most anticipated college hockey games of the season." Each school is steeped in hockey tradition. BU has won the national championship four times (1971, 1972, 1978 and 1995), while Cornell has claimed the title twice (1967, 1970). The Terriers boast the “Olympic Four” of Jim Craig, Mike Eruzione, Jack O’Callahan and Dave Silk, who helped lead the United States to Olympic gold at Lake Placid in 1980. Cornell alum Ken Dryden is an NHL legend; a five-time Vezina Trophy winner as the league’s best goaltender and winner of six Stanley Cups as a member of the Montreal Canadiens. Combined, the two schools have seen nearly 80 former players forge careers in the National Hockey League, including the likes of Chris Drury, Keith Tkachuk and John Cullen (BU), as well as Dryden and Joe Nieuwendyk (Cornell). The BU–Cornell rivalry began on Jan. 10, 1925, with a 7-2 victory by the Terriers, and includes two match-ups in the NCAA title game (1967, 1972). However, the schools have met only sporadically since BU left the ECAC to join Hockey East in 1984-85. Madison Square Garden, the 19,500-seat home to the NHL’s Rangers and NBA’s Knicks, will serve as the venue to re-launch this storied rivalry. Two additional games will follow the Madison Square Garden event, to be played at each school’s home site in the coming years. Rich Brennan was a second team All-American on BU’s 1994 NCAA finalist team and a standout defenseman on the 1995 National Championship team. Following a well-traveled professional career in North America that included 50 NHL games, Brennan has continued his career in Europe, spending the past three seasons in the top German professional league. This past year, he was the top-scoring defenseman (11-15-26) on the Sinupret Ice Tigers. The Ice Tigers' second-leading scorer was Scott King, who played half a season for BU as a member of the ill-fated ’96 recruit class. According to a post yesterday on the Warrior Rink Rat blog, former BU captain Albie O'Connell, who had been an assistant at Holy Cross and previously at Niagara, returns to Hockey East as an assistant to Merrimack Head Coach Mark Denehy. O'Connell, who had 108 points as a Terrier, played three years of professional hockey after college. Central Scouting's final ranking of 2007 draft eligibles are out. The rankings were completed prior to the World U18 Championships and don’t reflect that event. All the BU draft-eligible recruits moved up from their mid-term rankings, save Kevin Shattenkirk, who dropped to #34 among North Americans. However, other draft services, such ISS and McKeen’s, have the U18 captain ranked considerably higher. Goalies are rated separately. 2008 recruit Kieran Millan was unranked at midterm, but #17 among North American goalies in the final ranking...Matt Marshall, Glass's teammate at Nobles and a prospect that BU and other HE schools are interested in, dropped from #39 at midterm to #63... Colin Wilson is not ranked because he is draft eligible in 2008 due to a late birthdate, however, services both McKeen's and ISS project him to be a high first round choice...Both Shattenkirk and Cohen were ranked well ahead of D- Brandon Smith (#68) whom BU had recruited, but lost to Wisconsin. 2008 recruit David Warsofsky, the USHR Prep Defenseman of the Year, has been Selected for the Masschusetts Select 17 Team that will compete this summer in the National Festival...The Salem News, which had the early scoop on Brian McGuirk's selection as Terrier captain for the 2007-08 season, now profiles the senior to be from Danvers...Brian''s predecessor a decade ago, Chris Drury takes his track record of playoff excellence into the Conference semi-finals where he's expected to match-up with the Rangers Jaromir Jagr. A 2-goal, 1-assist performance by incoming freshman Colin Wilson wasn’t quite enough to lift Team USA to a third consecutive World U18 championship, as Russia won the gold-medal game today, 6-5. Team USA started fast with two goals early in the first period, including a shorthander by 2008 recruiting target Vinny Saponari. Russia tied the score before Wilson’s first goal, with 90 seconds left, produced a 3-2 lead after one period. Two goals in the second gave Russia a lead until James VanRiemsdyk, assisted by Wilson, knotted the score at 4. Russia added two goals in the final period before Wilson’s second marker—an extra attacker goal in the waning seconds—brought the United States within one. Wilson was named player of the game for Team USA, just as Kevin Shattenkirk was in the semifinal win on Friday. Shattenkirk was named to the all-star team, and was selected as the outstanding defenseman in the tournament, while Wilson and UNH-bound VanRiemsdyk, who both played on the gold-medal 2006 U.S. team, were the overall scoring leaders, each tallying 5-7-12. Wilson finished his final NTDP season with 30 goals and 44 assists in 56 games (pre-tournament stats). Emcee Bernie Corbett reminded attendees that there are only 168 days to the first practice and that the season will open in Alaska and include a road trip to Ann Arbor, Michigan to meet the Wolverines and the Madison Square Garden game on November 24th against Cornell. Former BU captain Mike Sullivan and Assistant Head Coach David Quinn leave tomorrow to coach Team USA in the World Championships. 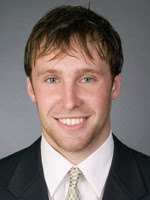 The USA staff also includes Brent Bergland, former Terrier team manager and video coordinator, who now holds the latter position for the Bruins. Thanks to blog contributor CDRAL for these notes from the banquet. We hope to add some additional information later from some other folks who attended the event. We begin with two features on incoming freshman goalie Adam Kraus. An article on the Los Angeles Jr. Kings Web site (scroll to 4-10-07) chronicles the sometimes bumpy path that led him BU. The second, posted on the Alaska Avalanche site, reveals that Kraus also considered Colorado College, St. Cloud State and UA-Anchorage before selecting BU. He cited Agganis Arena, the City of Boston and BU’s being a national contender as the reasons for his choice. Kevin Shattenkirk's hometown newspaper in Westchester, N.Y. reported on his player-of-the game performance in Friday's 4-3 shootout win for Team USA in the semifinals of the World U18 Championships. USA is playing Russia this morning in the gold-medal game. Going into the game, Colin Wilson is tied for the team scoring lead with nine points. Today, we examine BU hockey connections with movies, which goes back nearly 40 years. And it's spiked with some "six degrees of..." action, just for fun. In 1970, Terrier All-American Mike "Cannon" Hyndman played Francois Lafleur, the Cornell skater who puts a mouse under Ryan O’Neal’s eye in “Love. Story.” Hyndman related the story that O'Neal could barely stand on his skates, so Mike had to hold him up by the back of his pants, while punching him with the other hand. Besides Hyndman, another actor made his screen debut in this movie--'69 Harvard grad Tommy Lee Jones. Jones' college roommate was Al Gore whose wife, Tipper, graduated BU in 1970, the same class as Hyndman. 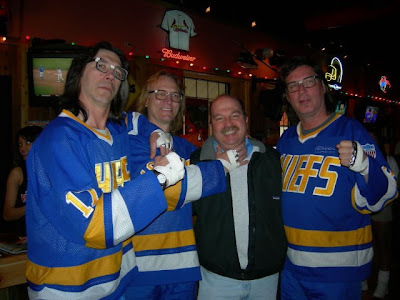 Another BU All-American, Steve Stirling, who currently coaches the Tampa AHL affiliate Springfield Falcons, was an extra in the hockey scenes in the 1977 sports classic, “‘Slap Shot,” which made cult figures of the “Hanson Brothers” (more about them later). Stirling, who also has coached the New York Islanders, reported that the film’s lead, Paul Newman, occasionally joined the extras for a game of shinny between scenes. Stirling's GM at Springfield is Bruce Landon, who played goalie for former Terrier coach Jack Kelley when he led the 1972-73 New England Whalers to the first WHA championship. Hyndman played 27 games for the Whalers that season. Kelley’s son, David, who captained Princeton's hockey team, wrote and produced the enormously popular film “Mystery Alaska” in 2004. Four Terriers--Mike Eruzione, Jack O'Callahan, Jim Craig and Dave Silk--were, of course, primary characters in 2004's "Miracle," which chronicled the gold-medal winning 1980 U.S. Olympic Hockey team. Former Terrier Bobby Hanson was cast in the role of Silk. Hanson, whose minor league hockey career included a stint with the now-defunct Macon Whoopees, is married to former UNH field hockey player Nikki Pandolfo, first cousin to Jay Pandolfo and Mike Pandolfo. Current Terrier Brian Strait appeared in a USA Hockey skills video released this past fall. And now, we have “Clark, the Canadian Goalie,” a six-minute video brought to our attention by blog contributor Scarlet. Starring former Terrier forward Nick Vachon, this tongue-in-cheek short –with unknown date of production— follows Clark as he transitions from stopping pucks to a new career as a baseball shortstop. Vachon played 24 games for BU in the 90-91, and 91-92 seasons, scoring 6-8-14. His biggest goal may have been one scored in BU's 5-4 win over Maine early in his sophomore year. [Note--Mike Prendergast scored the game-winner shorthanded in the final 30 seconds; credit to blog contributor defkit] He later played one NHL game for the Islanders in the 1996-97 season after having been acquired from the L.A. Kings in a trade for Hobey Baker winner Chris Marinucci [credit to Ed Moller]. Vachon currently is an assistant coach for the Los Angeles Jr. Kings, whose outstanding defenseman Max Nicastro (scroll down) is BU's first 2009 recruit. Longtime Terrier fan Ed Moller has been to nearly every Frozen Four since the early 1990s, usually accompanied by his wife and son. Earlier this month at the finals in St. Louis, he found himself surrounded by these icons of hockey filmdom and WHA infamy. 2007 recruit Colby Cohen, who easily outdistanced all other USHL blueliners in scoring, was named a second team USHL All-Star. He finished with a 13-47-60 line and was the only defenseman among the leagues’ top 25 scorers—despite missing the first seven games of the season. He began the year with the NTDP U18s and registered a goal and seven assists before joining the Lincoln Stars. BC recruit Nick Petrecki, a projected early first round draft choice, also was named to the 2nd team. UPDATE: New England Hockey Journal posted a feature on Cohen in its April issue. At the time of Cohen's move from the NTDP U18s to the Lincoln Star this past fall, there were some media suggestions that Cohen had left Ann Arbor due to "lack of playing time" and that he had "rubbed at least some of his teammates the wrong way." Some of Cohen's comments in the article seem aimed to dispell both of these contentions. The stats in the article are out of date. Those in the above paragraph are correct. The highly-regarded recruiting lists maintained by Chris Heisenberg have been migrated to new Web sites. Click here for the new 2007 recruit class list and here for the new 2008 list. Colin Wilson and Kevin Shattenkirk are in Finland with Team USA in the World U18 Championships. Made up largely of NTDP U18 players, Team USA reached the playoff round after today’s 8-0 wipeout of Latvia. Wilson contributed a goal and an assist bringing his total after four games to 1-4-5. Shattenkirk, who was featured in a pre-tournament article in his hometown newspaper, registered his third assists of the tournament. Team members wore black armbands to honor the victims of the Virgina Tech tragedy. Shattenkirk and Cohen were among the 83 North American and 21 European draft-eligible players invited to NHL Central Scouting’s Combine, which begins May 29. Another invitee is Matt Marshall, a 2008 prospect who is on BU’s radar. Marshall, ranked 39th in Central Scouting’s midterm rankings, will be a senior at Nobles, where he is a teammate of BU 2008 recruit Andrew Glass. Terrier fans will remember Tom O’Regan as a high-scoring forward in the early 80s and co-captain of the 1982-83 squad. His son Tommy now is making a name for himself and was selected to play in this weekend’s Massachusetts Hockey Festival for ’92 birthdates. Former Terrier forward and current NTDP U17 head coach John Hynes is one of five finalists for the 2006 USOC Developmental Coach of the Year award. Next season, Hynes moves up to the NTDP U18s who will play an exhibition game against BU on December 8. Last Spring, Hynes coached the U18s--including Brian Strait and Luke Popko--to the World U18 Championship. Another 2008 recruit, David Warsofsky,will join the NTDP U18s next. He was invited to join the national program last summer, but elected to play another season at Cushing where his brother was a PG student. Warsofsky's roommate at Cushing, Ryan Bourque, another BU recruiting target--for 2009--will also head to Ann Arbor, having accepted an invitation to play for the U17 team next season. "I had no idea he was going to get so much better so quickly, that his competitiveness would make him so special," says Parker, who has coached 19 Olympians and 54 future NHL players. "He's not the guy who wows you with speed or stickhandling or the hardest shot. But I don't think I've ever coached anybody as competitive. If you were to wake Chris up at three o'clock in the morning and tell him, 'We've got a pickup game,' when he'd get on the ice he'd have to beat you to that puck." Still, Drury fought with teammates who wouldn't match his fire in practice. He called out anyone he thought was dogging it. Once, as the players were doing sprints on stationary bikes, Drury sat next to a freshman who was just going through the motions. When the drill ended, Drury said, "If that's the way you're going to do it, why don't you get out of here right now?" Mike Eruzione, the 1980 Olympic hockey star who as an assistant at BU coached Drury, says, "He's not superskilled. He just wins." 2007 recruit Colby Cohen had four assists for Lincoln on Saturday night, bringing his season total to 59 points (13 goals, 46 assists). He has three regular season games left to reach the 60 point mark. Cohen had begun the season with the NTDP U18s but left after 12 games. During that time he tallied one goal and seven assists, the final one coming in the U18s' 5-4 win over the team crowned national champion yesterday, Michigan State. Colin Wilson and Kevin Shattenkirk and their U18 teammates head for Finland this week to defend Team USA's title in the World U18 championships. Last year's gold-medal winning U.S. squad featured current Terriers Brian Strait and Luke Popko, as well as Wilson who moved up from the U17s to participate. The same path is being taken by Terrier recruiting target Vinny Saponari, who was promoted from the U17s last month and earned a roster spot for the Worlds. Three future Terriers, 2007 forward Nick Bonino, 2008 forward Andrew Glass and 2008 defenseman David Warsofsky, were named to Team New England for the upcoming ProAm Hockey Pre-draft International Tournament to be played May 11-13 in Walpole. Congratulations to John Curry for earning first team ACHA All-American East honors, to Matt Gilroy and Sean Sullivan for making second team and to all the other All-Americans. Curry becomes BU's seventh first team All-American goalie and the first since Cleon Daskalakis in 1983-84. This coming week, we'll recap all the honors received by Terriers skaters during recent weeks. If you haven't already discovered it, there's a terrific feature on the NHL's Web site that allows you to see virtually every goal each NHL player has scored. Click on "players" and go to a player's page, for example, Chris Drury's page . Then click on the gray "video" tab and you'll be taken to a page with links to all 37 goals Drury has scored this season. For goalies, there is a selection of their best saves.